Kim, M.-S. Bae, J.-W. and Park, E.-J. 2018. Postharvest processing decreases the richness of bacterial taxa in the phyllosphere of broccoli. Journal of Applied Microbiology, Vol. 125, Issue. 1, p. 295. Ruokolainen, Lasse Lehtimäki, Jenni Karkman, Antti Haahtela, Tari Hertzen, Leena von and Fyhrquist, Nanna 2017. Holistic View on Health: Two Protective Layers of Biodiversity. Annales Zoologici Fennici, Vol. 54, Issue. 1-4, p. 39. Cepeda, Alfonso Mario Thawer, Sumaiyya Boyle, Robert J. Villalba, Sara Jaller, Rodolfo Tapias, Elmy Segura, Ana María Villegas, Rodrigo and Garcia-Larsen, Vanessa 2017. Diet and Respiratory Health in Children from 11 Latin American Countries: Evidence from ISAAC Phase III. Lung, Vol. 195, Issue. 6, p. 683. Ruokolainen, Lasse Fyhrquist, Nanna and Haahtela, Tari 2016. The rich and the poor. Current Opinion in Allergy and Clinical Immunology, Vol. 16, Issue. 5, p. 421. 1. Minihane, AM, Vinoy, S, Russell, WR, et al. (2015) Low-grade inflammation, diet composition and health: current research evidence and its translation. Br J Nutr 114, 999–1012. 2. Haahtela, T, Holgate, S, Pawankar, R, et al. (2013) The biodiversity hypothesis and allergic disease: a statement paper of the World Allergy Organization. World Allergy Organ J 6, 3. 3. Hanski, IA, von Hertzen, L, Fyhrquist, N, et al. 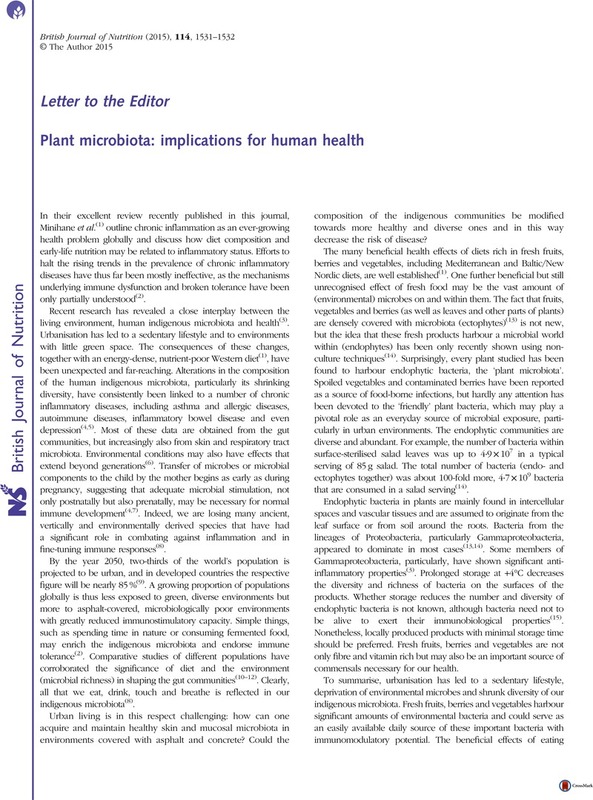 (2012) Environmental biodiversity, human microbiota and allergy are interrelated. Proc Natl Acad Sci U S A 109, 8334–8339. 4. West, CE, Renz, H, Jenmalm, MC, et al. (2015) The gut microbiota and inflammatory noncommunicable diseases: associations and potentials for gut microbiota therapies. J Allergy Clin Immunol 135, 3–13. 5. Belkaid, Y & Hand, TW (2014) Role of the microbiota in immunity and inflammation. Cell 157, 121–141. 6. Burton, T & Metcalfe, NB (2014) Can environmental conditions experienced in early life influence future generations? Proc Biol Sci 281, 20140311. 7. Rautava, S, Luoto, R, Salminen, S, et al. (2012) Microbial contact during pregnancy, intestinal colonization and human disease. Nat Rev Gastroenterol Hepatol 9, 565–576. 8. von Hertzen, L, Beutler, B, Bienenstock, J, et al. (2015) Helsinki alert of biodiversity and health. Ann Med 47, 218–225. 9. United Nation (2015) World urbanization prospects: the 2014 revision. Highlights. http://esa.un.org/unup/ (accessed May 2015). 10. De Filippo, C, Cavalieri, D, Di Paola, M, et al. (2010) Impact of diet in shaping gut microbiota revealed by a comparative study in children from Europe and rural Africa. Proc Natl Acad Sci U S A 107, 14691–14696. 11. Yatsunenko, T, Rey, FE & Manary, MJ (2012) Human gut microbiome viewed across age and geography. Nature 486, 222–227. 12. Martinez, I, Stegen, JC, Maldonado-Gomez, MX, et al. (2015) The gut microbiota of rural Papua New Guineans: composition, diversity patterns, and ecological processes. Cell Rep 11, 527–538. 13 Jackson, CR, Randolph, KC, Osborn, SL, et al. (2013) Culture dependent and independent analysis of bacterial communities associated with commercial salad leafy vegetables. BMC Microbiol 13, 274. 14. Leff, JW & Fierer, N (2013) Bacterial communities associated with the surfaces of fresh fruits and vegetables. PLOS ONE 8, e59310. 15. Hessle, C, Andersson, B & Wold, AE (2000) Gram-positive bacteria are potent inducers of monocytic interleukin-12 (IL-12) while gram-negative bacteria preferentially stimulate IL-10 production. Infect Immun 68, 3581–3586.